SynoGene provides fast and high quality service for recombinant antibody expression and purification (soluble Fab & scFv expression in E. coli and full IgG/Fab expression in mammalian cell lines). SynoGene is able to provide up to gram of recombinant antibodies and Fabs in a shot time by transient production in mammalian cells. The yields of full-length IgG/Fab are ranked the highest in the field by optimized expression systems from gene, secretion signal, expression vectors, culture conditions to purification in both mammalian cells and E. coli. SynoGene is able to generate high yield stable cell lines/pools for you. - Super high yield of transient expression system to provide up to gram of IgG/Fab for you. Unbeatable in the field! - Fab production in 293 cells, an alternative way to produce Fabs which are difficult-to-express in E. coli. Only at SynoGene! - High yield/titer stable cell line/pool development to provide cell lines or pools for large scale production. - Powerful bacterial secretion system for Fab and scFv production. Unbeatable on the market! Our expertise can help you overcome bottlenecks in antibody fragment expression and purification, such as difficult-to-express proteins, insolubility, aggregation during purification, lose of specific affinity during purification, difficulty in endotoxin removal etc. We provide flexible service from small-scale (shake flask) to large scale (bioreactor) production and purification. Quality is guaranteed to meet your needs from research to pre-clinical development. Fig. 1. The expression level of a human Fab in E. coli was increased 100x after optimization. This is a Western blot probed with anti-human Fab antibodies. Fig. 2. SDS-PAGE analysis of a recombinant monoclonal antibody that was prone to aggregation, misfolding and degradation during production. Following optimization, this recombinant antibody was successfully purified to a monomeric form. 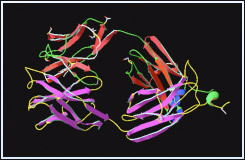 3: Purified by a regular method (protein A). (Non-reducing).